Last edited by Imitation-Cheese on Jan 20 2014, 1:35am, edited 2 times in total. There are no formal rules from ATA regarding CC. Each clan has the right to have uncensored CC, so long as the ToU are not violated. Clans may also have more strict chat rules for their CC. Generally, the owner is responsible for everything posted in CC. 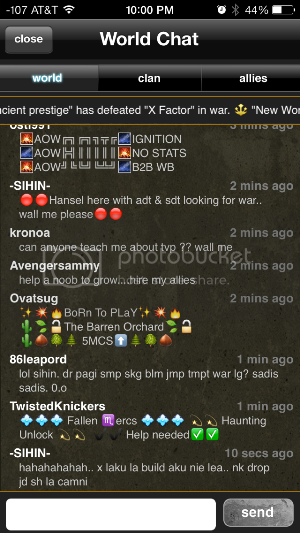 To do this, the owner must appoint admin to monitor clan chat. The owner also has the power to kick players from their clan, should their chat rules be broken. 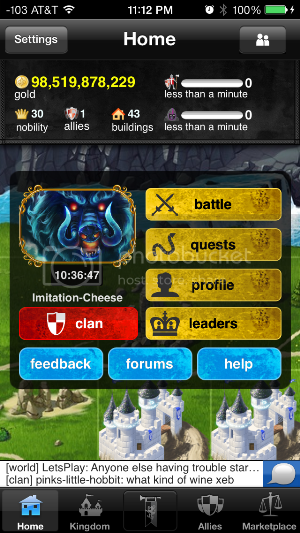 As of the time of this writing, there is no way for clan owners or admin to silence players in CC. Admin are responsible for ensuring that their clan CC rules are being enforced and to kick players who refuse to follow CC rules. Last edited by Imitation-Cheese on Jan 20 2014, 7:20pm, edited 5 times in total. As with CC, AC has no formal rules. However, there is no way to prevent your owner and allies from posting in AC. You may silence your allies by dropping them, but that is not advisable. Certainly, there is no way to block communication with your owner through AC. Last edited by Imitation-Cheese on Jan 20 2014, 7:23pm, edited 1 time in total. Private messaging is not moderated or filtered. You may prevent someone from messaging you by blocking them. Last edited by Imitation-Cheese on Jan 20 2014, 7:33pm, edited 1 time in total. Emoji are the small images you often see in WC that are not text. Last edited by Imitation-Cheese on Jan 20 2014, 7:42pm, edited 1 time in total. 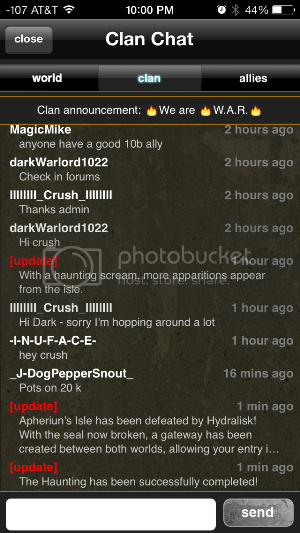 To view an in-game group chat, simply tap the white bar near the bottom of the screen. Then tap on the group you'd like to view. 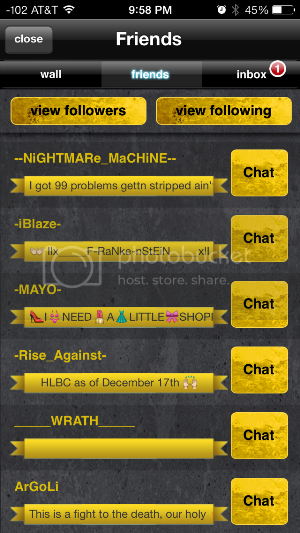 The image below shows the WC group chat function in the game. To speak in WC, you must use a speaker. You earn 5 speakers every day automatically, up to a maximum of 25. It will cost you one speaker to post a message in WC. The banner at the top is called the World Announcement (WA). You may post a message in the WA for 26 speakers. Speakers can be purchased from the Oracle. Note: Only accounts that are linked to a device will regenerate speakers for free. PC-only accounts will not regenerate speakers automatically. The image below shows the CC screen. Chatting in CC is free. The top of the CC screen is the Clan Announcement (CA). Only the clan owner and admin may change the CA. Finally, the image below shows AC. AC is a group chat where only your owner and your allies can chat. You can only see one level up and one level down. This means that you can see what your owner says, but you can't see what their owner or allies are saying. Similarly, your owner cannot see what your allies are saying, but you can. Last edited by Imitation-Cheese on Jan 20 2014, 8:25pm, edited 1 time in total. PM is a two-way private chat. To PM someone, you must be friends with that person. Find their profile in your friends list by pressing the button in the top, right corner of your screen or search for them using the BL. Once you find their profile or their name in your friends list, click on "chat." As seen above, new message notifications for PMs will appear over the "inbox" tab. Last edited by Imitation-Cheese on Jan 21 2014, 12:02am, edited 3 times in total. Palringo is a 3rd party messaging app. It is free for PC, iDevice, and Android. It is used for many purposes. 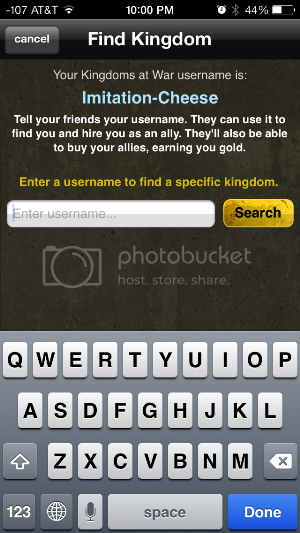 It allows players to create their own groups for special purposes as well as to continue chatting outside the game. Last edited by Imitation-Cheese on Jan 20 2014, 8:34pm, edited 1 time in total. This game is equipped with a language filter to block profanity. Bypassing the filter is done by replacing parts of the word with other characters. For example, if the word "pumpkin" was filtered by the game, then posting the word pumpkln or p*mpkin would be considered a bypass. Bypassing the language filter is a silencable offense. The language filter applies to WC, forums, walls, and CC, although CC isn't moderated. However, if a moderator is present in your CC, s/he may silence you. Last edited by Imitation-Cheese on Jan 20 2014, 8:39pm, edited 1 time in total. 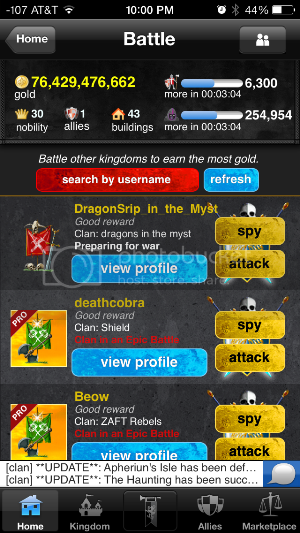 On your home screen, select "battle"
Then select "search by username." Last edited by Imitation-Cheese on Jan 20 2014, 11:23pm, edited 3 times in total.